If your Labrador has an itch he can’t scratch, mange -- caused by two main types of mange mites -- might be the culprit. Sarcoptes scabiei and demodex mites are the types of mites that live on the skin and in the hair follicles of Labradors and other dogs. Mites are microscopic parasites that feed off of Labradors and other hosts. The sarcoptes scabiei mite that causes sarcoptic mange in Labradors also causes scabies in humans. Under a high-definition microscope, the scabiei mite looks similar to a tick with several long appendages. The demodex mite has a long alligator-type body with eight legs or appendages. Mites often live on your Labrador’s skin, but generally don’t cause symptoms unless your dog’s immune system is weakened for any reason. Early symptoms, such as itching and chewing, often mimic those associated with allergies. The common symptoms of mange, both sarcoptic and demodex, include itching, hair loss around the eyes, head and legs, a red skin rash and crusty skin. Also, you may notice a foul odor on your four-legged friend’s skin if he has mange. In Labs, the rash may not be noticeable until his thick coat begins falling out. 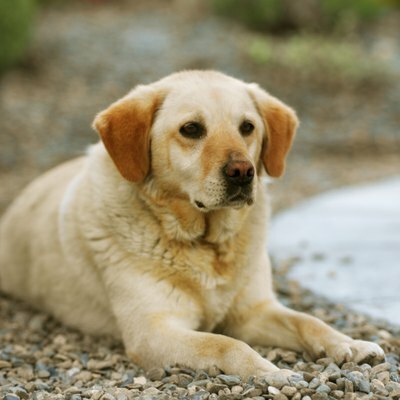 When you initially take your Lab to the veterinarian, he generally rules out other possible causes, such as food or flea allergies, chiggers or bacterial infections. Your veterinarian generally takes a skin sample by scraping your furry friend’s skin and views it under a microscope to see whether your Labrador is suffering from mange. Mange is often treated with a specialized shampoo prescribed by your vet. Your vet may also prescribe a medicated dip for your Lab. He generally recommends repeat treatments for up to eight weeks to kill the living mites and the larva after the eggs hatch. According to WebMD, benzoyl peroxide gel ointment may also help treat localized mange that has not yet spread over your Lab’s entire body. Keeping your Lab healthy is key to mange prevention since the mites are always with him. This is fairly easy becaus the breed generally doesn't suffer from conditions common to other breeds, such as thyroid disease and diabetes. However, keeping his living area clean and bathing him often helps deter the growth. Keep your pet away from other animals suffering from sarcoptic mange, which is highly contagious. Work with your vet and set up a vaccination schedule for common virus strains, such as kennel cough, to ensure his immune system stays strong.